When Marijuana is smoked, its active ingredient THC can cause a variety of short and long term effects on the brain. THC, the active chemical in marijuana, has many effects on the brain, some which present during short-term abuse and some which occur over months or even years of marijuana use. THC creates most of the effects marijuana has on an individual, and though many claim it to be harmless, there are ways that it can negatively affect all parts of the human body, most specifically the brain. 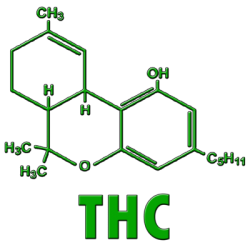 The chemical THC is the most well known of those found in marijuana, even though “marijuana contains some 400 other chemicals as well” (CESAR). In fact, synthetic THC has become a more commonly created product as of late, especially as a result of the medicinal use of marijuana. Identifying THC’s effects separately from those of marijuana in general can be difficult because the chemical is the most active ingredient in the drug. Overall, marijuana’s effects on the brain (both short-term and long-term) are mostly caused by THC. Marijuana is smoked or ingested, and THC travels through the bloodstream into the brain. This often occurs much faster when the drug is smoked. The THC affects the brain’s endocannabinoid system by overwhelming its receptors. It acts as another kind of cannabinoid (natural chemicals that occur in the brain) and overwhelms the endocannabinoid system. The system is then unable to function properly, and this causes a number of effects on the brain and the body. The parts affected are not able to communicate with the other parts of the brain, also causing many strong physical and psychological effects. Through this system, THC affects many different parts of the brain. It can also alter a person’s physical state, mood, and many other functions of the body through the way it affects the brain. Memory and learning: When someone is currently high, it will be harder for that person to retain things they recently learned or even to remember things that just happened (or that happened previously). After the individual comes down from their high, there is a chance they will not remember everything that happened while they were under the influence of the drug. Perception: A person’s perception of sights, sounds, touch and other sensations will often be affected by the chemical THC. In addition, an individual will not be able to perceive the passage of time as well as they normally can, and time may seem to pass very slowly or very quickly. Coordination: Since a person’s perception of their own body and what’s around them will often be distorted, their coordination will be affected as well. This also happens because the brain experiences a slowed reaction time when a person is high. Judgment: It is important for someone to understand that their judgment will be impaired by THC when they smoke marijuana. Things they normally would not do may seem reasonable or they may even do something dangerous or potentially harmful without realizing it, all because their complex thinking has been affected. Pain sensitivity: The brain will also not be able to distinguish the intensity of a pain you might feel because THC will be affecting its ability to do so. Therefore, you will not be able to gauge pain accurately when you are high. Appetite: The chemical also affects the hypothalamus, which increases a person’s appetite. Emotional responses: By interfering with the brain’s ability to process emotions, good emotions (like happiness) might become much stronger (giddiness), while negative emotions (like nervousness) may become more intense as well (paranoia, fear). The drug also affects the reward center of the brain, causing euphoria. This especially occurs right after the drug has just been used. These short-term effects may not be extremely dangerous, but they could become a problem based on where the individual is. Some people decide to drive while high because their judgment is impaired, and they believe themselves capable when they are not. This can lead to an accident or other problems as the result of poor coordination, poor concentration, and slowed reaction times. The immediate effects of THC on the brain should be understood because, like every other drug, they can cause problematic results. THC also has a number of long-term effects on the brain. However, these have not been studied as thoroughly as the short-term effects. Still, THC has been known to cause many problematic issues in the way the brain functions, some of which may possibly take a long time to reverse. Lowering of IQ: According to the NIDA, studies have shown that “heavy cannabis use begun in the teen years and continued into adulthood brings about declines in IQ scores.” This is extremely disconcerting as it proves the learning and memory effects that the drug causes in the short-term can become lasting. Mental disorders: Links have been found between depression and other mental disorders and the consistent abuse of marijuana. In addition, the abuse of marijuana in the long-term can cause a preexisting case of schizophrenia to worsen. Hallucinations, extreme paranoia, anxiety, and suicidal thoughts have also all been linked to long-term use of marijuana and THC. The drug (and its main chemical) affects the brain in many ways and impairs its ability to function. It is important to understand THC’s role in the way marijuana affects the brain, especially before you consider using the drug.